As summer draws to a close, it can be nice to sit in the garden with some lantern light of an evening. 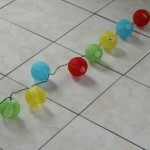 Here I do a quick review on some of the ball shaped garden lights in 4 different colours I have managed to get hold of. One of my main requirements (obviously in addition to the lights themselves) was to purchase some which are solar powered. 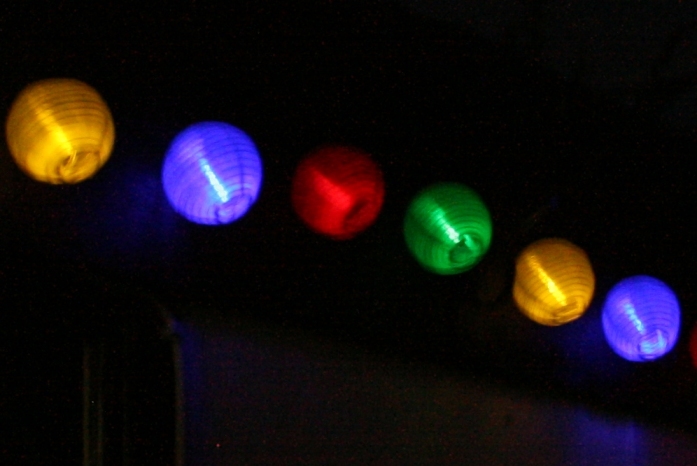 My reason is that I really do not want to have to run power all over the garden, and with the options available online such as LED garden lights with different styles of lantern I was spoilt for choice – as solar powered lights seem to be very popular and also, much to my delight – very cheap! This doesn’t mean they have to be rubbish though, not at all, mass production techniques nowadays mean that some fantastic looking lighting is available along with the solar powered battery charger to go with them. Here are the ones I have. Now there are actually a whole line of 20 lamps, but to zoom in I am showing just the 6. You can see they are in different colours which repeat along the line. RED, GREEN, YELLOW and BLUE. The whole line is around 15 ft in length with some extra wire at the end so that you can run the solar power panel to a place in the garden where it will be able to collect some sunlight. To be honest – this needs to be longer on reflection because in my case the string of lanterns is quite high up (around 7 ft) so realistically I need it to be a bit longer than the approx 5ft provided. Not to worry, I will find a solution! Lets take a close look at the kit as it comes supplied. Above you can see you get 20 lanterns – close up reveals how the LED lights fit into the lanterns themselves – a small frame is built around each LED and this is pushed through the lanterns to stretch them out into the ball shape. They “clip” into place and hold the shape perfectly well under strain. Take care to notice that each LED is a particular colour – to match the garden lights and make them stand out better, there is an LED for each shade of light. I did not make the mistake of fitting them incorrectly, but without careful attention to detail and if you rush, you could well find yourself having to disassemble each lamp and re-position in with its correct shade. The solar panel itself sits atop a garden spike which you can tilt to attain the correct angle of direction towards the sun depending on which way your garden faces. South facing gardens are well known for getting the most sunlight as the sun is at its highest position in the daytime sky at mid day in the south, as it rises in the East, travels South for mid day, then sinks slowly in the west to set at night. Don’t worry too much though if you don’t face directly south, the solar panel will still charge the batteries (I think they will be Lithium ION as thats a popular choice these days) on even a small amount of photons, but it will just take longer in direct proportion to how much light is gathered. You get the drift. Also above, you can see the actual garden spike in the top right, it comes in two parts and has that screw twister you can see – to present the correct angle. The entire kit took around 20 minutes to assemble, this is because I was messing around though and you can probably have these prepared for hanging in the garden for the perfect lantern lit BBQ in much less time. The plastic (white) frames around the lights are a little fiddly to install, but once you get used to doing it the right way it gets easy. 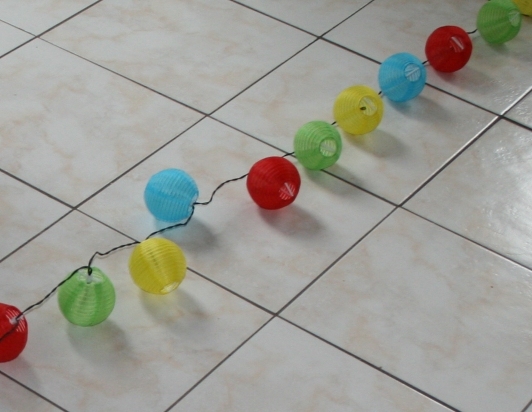 You just have to trust that the material on the lanterns won’t tear, and give it a little bit of extra force to twist the plastic loop within the light up and over the end of the frame – the other end just sits on the inner side of the spheres and presents no problem at all. 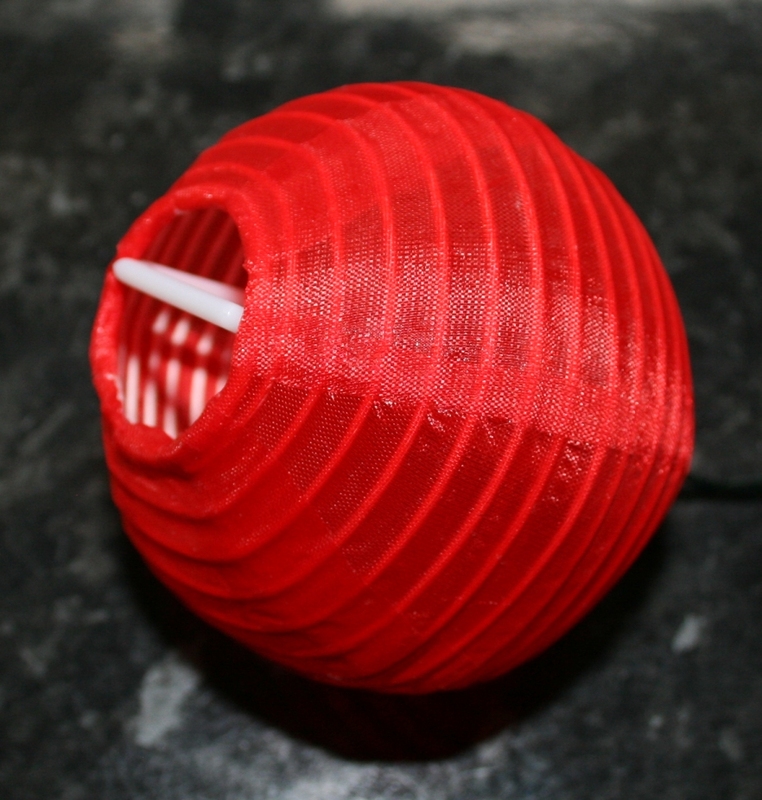 See the photograph below – it shows they are made of some kind of tough plastic material rather than just paper – this will extend the lifespan of the ball shaped lanterns for many an enjoyable evening in the garden as the sun sets. I am pleased with these – just need another set now because I want them all over the garden!